Simply genius! Fancy up plastic storage drawers with spray paint! Now you can leave them out without them looking like a cheap eyesore. Go check out the details and instructions for this spray paint project over at Scottsdale Moms Blog. I also like this idea for those smaller drawers that sit on a desk or on the counter in your bathroom. Well, isn’t that just the smartest idea!? Turn plastic trash cans into large outdoor planters, and save a couple hundred bucks! With the hammered spray paint, you would never guess that these planters were made out of plastic! The original source and instructions for this no longer exists (I think the website expired), but the idea is to spray paint cheap, plastic trash cans and fill them with cinder block or rocks before adding soil to weigh them down. 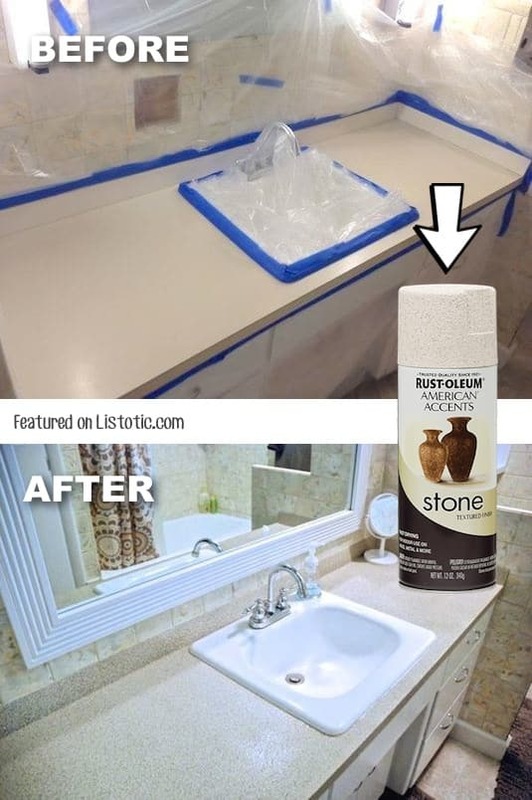 I’ll bet you never thought you could transform an ugly laminate countertop for less than $10 with spray paint! And, the Bright Green Door will give you all of the details and instructions for this money-saving project. You won’t believe the before and after pics! I just love remodeling projects that cost next to nothing.